Facts and history about the life and lifestyles of the Great Plains Native American Indians. Counting Coup was a practise adopted by many of the Plains Native Indian tribes as an indication of brave and heroic deeds in battle. Counting Coup was based on a type of point scoring system, by which different acts of valor were accorded different levels of honor and prestige. These acts of bravery, or 'war counts', were recorded on a 'Coup Stick' and deeds were indicated in various ways including the use of notches and feathers. In order for a coup to count it had to be witnessed by other warriors and then officially recognized by tribal council. The life, history and lifestyle of Native American Indians is a varied and fascinating subject. The following fact sheet contains interesting facts and information on Counting Coup. Counting Coup Fact 1: Definition: The term derives from the French word 'coup' meaning to "blow or strike" and is defined as "a highly successful, unexpected strike, act, or move; a clever action or accomplishment"
Counting Coup Fact 6: Feathers were cut and worn in a certain ways. A feather could be notched, split or dyed red which conveyed the exploits of the wearer that was immediately recognised by other Native Indians refer to Meaning of Headdress feathers. Counting Coup Fact 8: It was relatively easy to kill an enemy at a distance using a bow and arrow or a rifle, however, it took greater courage get close enough to the enemy to touch them without getting injured or killed. Counting Coup Fact 9: The greater the risk, the higher the award. Approaching an enemy at close quarters risked serious injury or death. Touching the enemy under enemy fire, and escaping unharmed, showed great bravado and a lack of fear. It was the daring required of close contact for which the greatest awards were given. Such an action caused great humiliation and dishonor to the enemy. Counting Coup Fact 13: More than one warrior might touch the body of an enemy and receive credit, according to the order in which this was done. 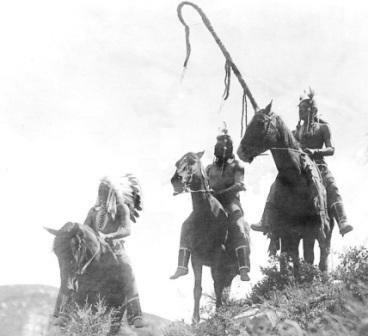 The Cheyenne counted coup on an enemy three times, any subsequent coups received no credit. The Sioux and Arapaho touched four times. Claiming coups often led to disputes, especially when several tribes fought together as allies against a common enemy. Counting Coup Fact 18: High social positions and status were afforded to the holder of many coups. The legendary Sioux Chief Red Cloud counted 80 coups.